Quick update as of 3/12/19. The Doordash offer is now at $150 or 15,000 Swagbucks. I wanted to share a quick little hack a friend showed me where you can sign up for Lyft and/or Doordash and get paid $200/$150 for doing ONE ride and/or ONE delivery. That’s a crazy return on your time that is well worth doing – even if you’re a big shot lawyer, doctor, or whatever. Sign up for an app called Swagbucks. If you want to support this site, feel free to use my referral link (I get a small referral bonus from Swagbucks if someone uses my link). 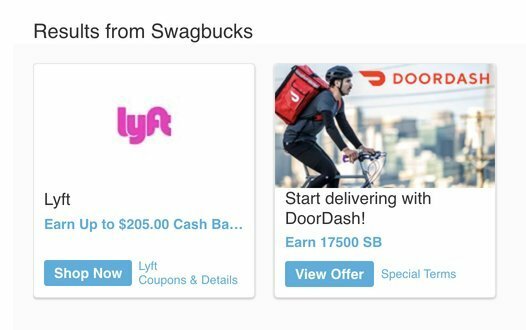 In the Swagbucks app, search for the signup bonus offers for Lyft and Doordash. You can do this by going to the search bar at the top of the Swagbucks app, then searching for the respective keyword. Sign up to drive or deliver for those services through the Swagbucks app. 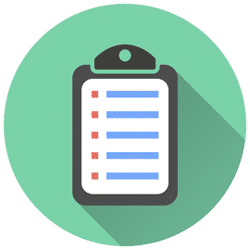 Get approved to drive or deliver, then do one ride and/or one delivery. These sign-up bonuses are way too good to pass up since they only require you to do one ride or delivery in order to earn the bonus. If it takes you an hour to do that, that’s good for $200/$150 per hour – lawyer or doctor money there! I haven’t done these offers yet, but my friend recently did the DoorDash offer and he said it only took him an hour at most to signup for Doordash, get approved to deliver, and do his one delivery (he had to wait a few days to get his DoorDash delivery stuff in the mail, but that was just waiting time that he didn’t have to think about). And a few months back, he signed up to do Lyft using this offer, did his one ride, and collected his bonus a few weeks later. I’m in the process of signing up for Lyft so that I can do the same thing and even though I don’t like driving, this is a no-brainer in my book purely based on how much I can make. 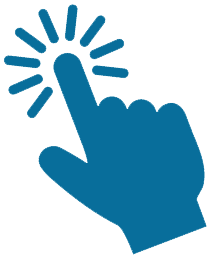 Note that you earn all of your money from Swagbucks in the form of Swagbucks points, which can be cashed out for gift cards. However, they let you use those points for PayPal gift cards, which you can then convert straight to cash. So essentially, you can get straight cash from Swagbucks. I’m not sure how long these offers will last, so I’d recommend jumping on these deals as soon as you can – they could always disappear tomorrow. 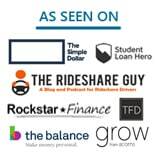 Remember that these offers are only for people who have never driven or delivered for Lyft, or DoorDash before, so, unfortunately, if you’re already signed up for these apps, you won’t be able to earn the bonus from Swagbucks.